“UGLY Birds” to Appear at Annual Return of the Buzzards! Exciting news, especially for those of you in Hinckley, OH. 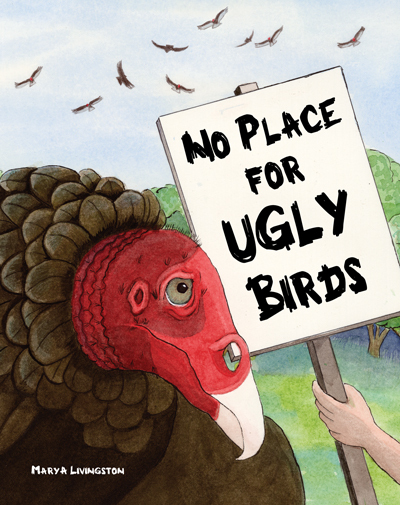 My new picture book, No Place for UGLY Birds, will be available at EarthWords Nature Shop in time for the Annual Return of the Buzzards! Scotty lives in a quiet little valley where not much exciting goes on. That is, until the day his neighbors decide the turkey vultures are too ugly. No Place for Ugly Birds – An amusing story with unintended consequences. This entry was posted in Art, Child's perspective, Illustrations, Nature, Nature Art, Picture Books, Turkey Vultures and tagged Kids Literature, Picture Books, rhyming story, vulture by MaryALivingston. Bookmark the permalink. Thanks, not bad for an Ugly Bird. Congratulations!! How exciting! Can’t wait to see it! I will let everyone known when it is up on the Publisher’s site and Amazon. That is wonderful news Mary! I have watched your illustrations progress but didn’t know it was a book already! Exciting it is! It is exciting. I am going to have to do a special post about the course and group…invaluable, absolutely invaluable. I do appreciate the phone calls when you located roadkill so I could shoot reference photos. Roadkill locator…..I’m putting that on my resume. Congratulations on your new book, very exciting and happy for your achievement. I would love to do an interview for my blog !! I don’t really have a lot of followers though. I have really enjoyed your posts, especially the interviews. You can check out Felicia’s blog at Artistic Expressions by Felicia Lilley. I am looking forward to the news that it is available elsewhere as well…it is exciting. But you do know it is a lot of long hard work. Should have news on Percy and another that I authored but did not illustrate. I am looking forward to your next stories as well! Wow! How cool! A PB about vultures! You are awesome!! Can’t wait to see it! I hadn’t been by in a while, so many wonderful things happening. Congratulations Mary! This is wonderful news. You’ve made it Mary and I am very proud to have been one of your fellow students. This is really great news, congratulations. I think the repulsion most people have is to their habits. I certainly appreciate them.